Following in my experiences with the tragic Loch Lomond I took the opportunity to exchanged for a bottle of Highland Park 12yo. I figure anything is a step up so go for something unexpected because I am drammed if I do and drammed if I don't. Though I had seen Highland Park many a time I had actually steered away from it purely based n the bottle. A foolish notion though it is, I thought for a long time that it looked too much like a bourbon bottle so I just skipped over it. None the less at the previous club meet a bottle of Highland Park 16yo made it's way to the table and so my experience began. is not a bad thing). To taste it is smooth on the lips and across the tongue, soft on the pallet with mild peat and smoke followed with honey-floral notes. I would like to say more but there just does not seem to be anything else there. The finish is medium in length with a slight dry bitterness in the throat with little else to add. Certainly easy to drink with something that wants you to return for another taste and find that element your looking for. In fact I can sense that because it is all so well weighted leaves the expression open to influence by longer ageing or additional casking (not that I know anything about the whiskey making process). 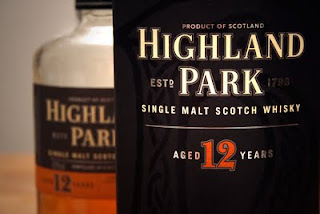 Not an excitable favourite in my whiskey tasting experiences and if your a drinker like myself that enjoys a full bodied whiskey with depth of flavour you may find the Highland Park 12yo a little bit floating in the middle of nowhere. Otherwise a good drop and nothing to be negative about.